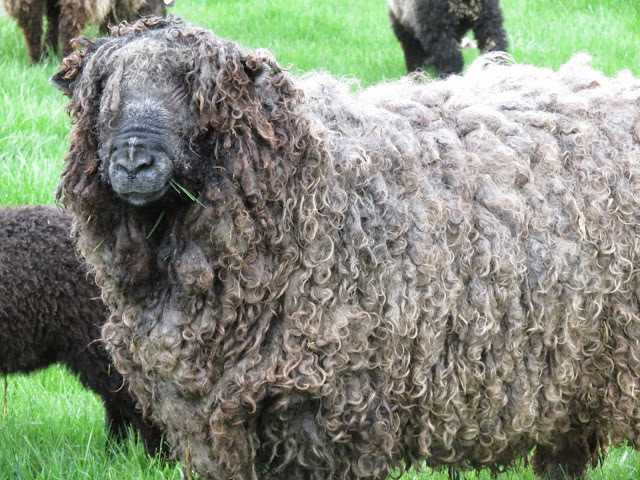 Meet Mr. Grimsby… a Leicester Longwool ram. 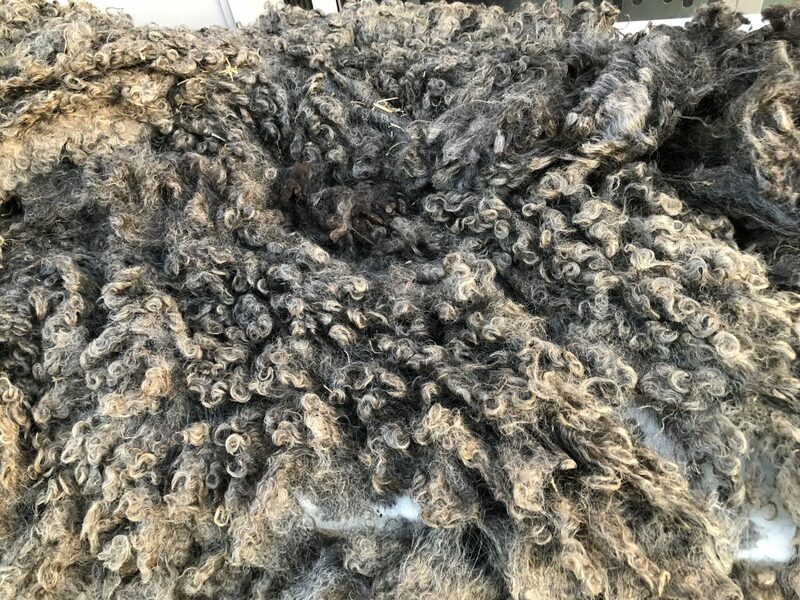 Mr. Grimsby is a Leicester Longwool ram fleece I acquired from David at The Berryhill Farm in Pine Island, MN. While a vendor at Shepherd’s Harvest, Lake Elmo, MN I met David and his ram Grimsby. Having the opportunity to see Grimsby before shorn is a huge plus in selecting a fleece. 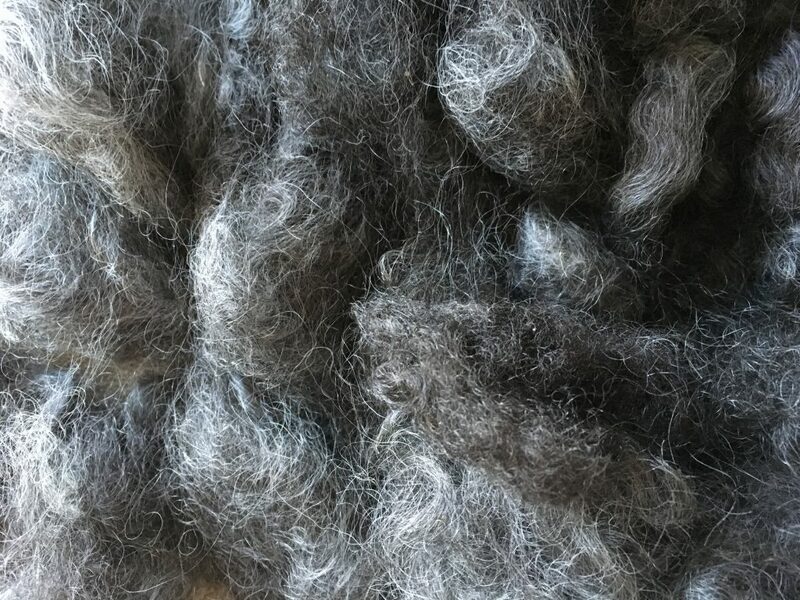 Once the fleece was shorn it was time to make sure it would be a good choice for handspinning. When checking for a stable fleece I want it to fit the breed standard. Checking the lock structure I refer back to the “Fleece & Fiber Sourcebook” by Deborah Robson and Carol Ekarius. Then choosing several locks from different areas of the fleece I perform a strand test to make sure the fibers are sound. Taking a lock holding the cut end in one hand between pointer finger and thumb and the tip end in the other hand between pointer finger and thumb. Pulling my hands apart hard the lock will make a pong sound. The lock should not be brittle. You should not hear a breaking sound. The fiber should be strong and healthy. First step in preparing the fleece to spin into yarn is skirting. I open the fleece up. Spreading it across a table. Mr. Grimsby is a large fleece. Working to remove all the waste fiber around the outside. You can see Grimsby is a relatively clean fleece. Shaking to remove second cuts. Then I begin to ‘monkey pick’ the vegetable material (VM). VM is a term we use in the industry to refer to straw, hay, burrs. 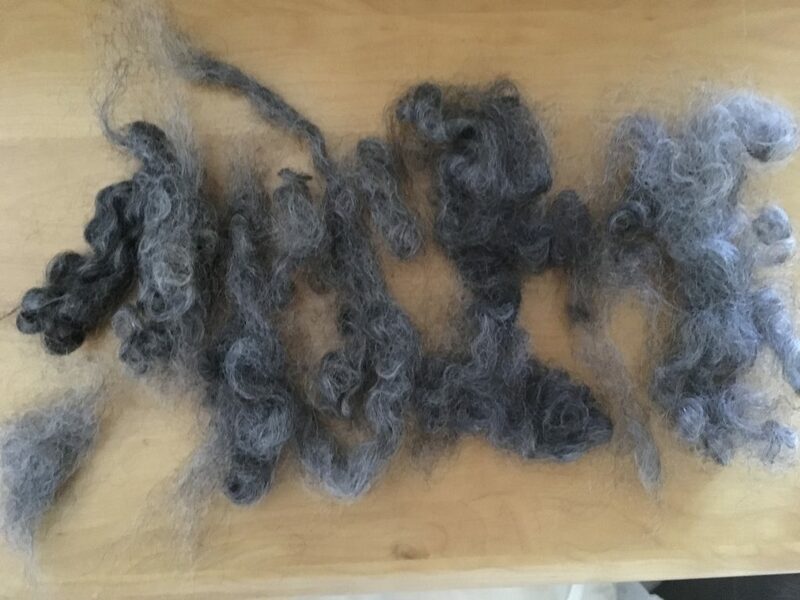 When I think I have all the barn yarn residue removed. I shake some more, pick some more and continue this until it has been removed. Skirting/picking/shaking is to me the most important step in processing a fleece (having chosen a sound fleece) from raw to finish. The more time I give to this stage the more enjoyable all the rest of the process will be. A gentle reminder VM does not come out when washing. If you do not pick it out now you will be picking throughout the process or you will end up with VM in your finished yarn. This is when I really begin to understand this fiber. Mr. Grimsby had some lanolin. The photo was the first of three washes using Power Scour by Unicorn Fibre. *Note typically I place the fleece in a colander to strain the water out without agitation. 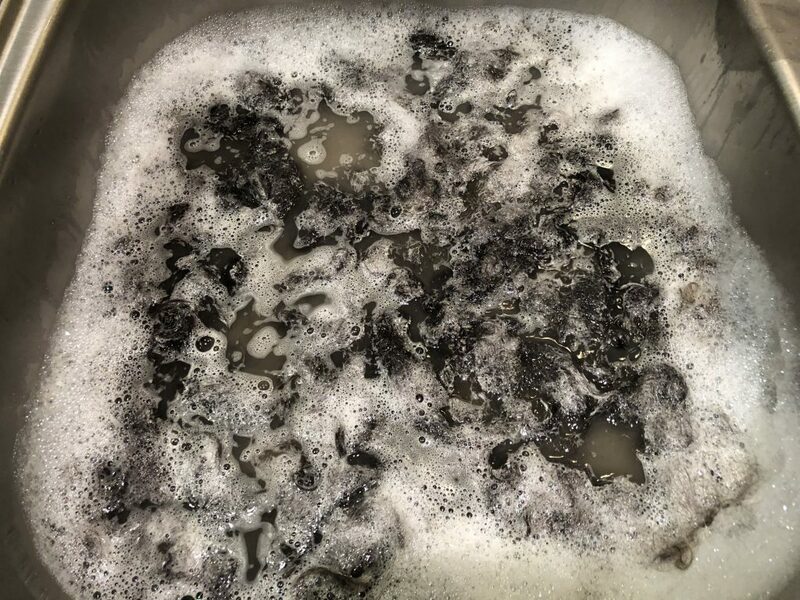 For this batch I did not properly set up my fleece cleaning station. Having neglected to retrieve the colander in haste. I ended up with some felting. 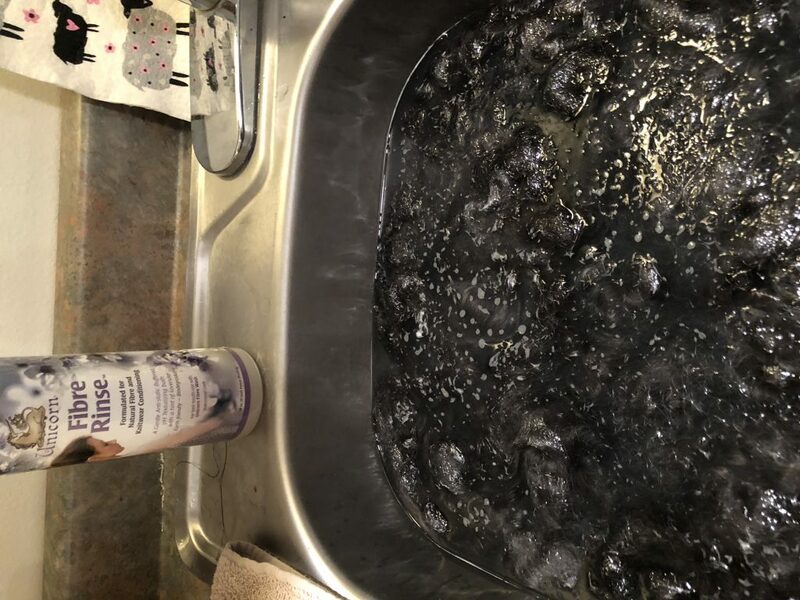 I did my first rinse between the second and third wash. Having decided there was still a bit too much dirt I opted for a third wash. Then two more rinses the final with Fibre Rinse from Unicorn Fibre. Then squeezing the fleece (should have used the colander) using a towel to roll the fleece in. It took a couple of bath size towels. Placing the fleece on a clean dry towel I began to pick it open to dry. Saving the lock structure was my goal to be able to spin from the lock. Quickly I became aware of my error by not using the colander to drain the fiber instead of squeezing. With the fiber opened up a bit it was left overnight to dry. I was a bit surprised the fiber was still damp in the morning. 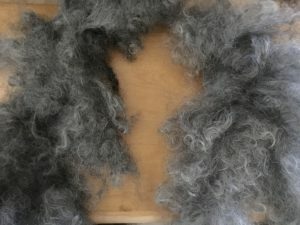 I turned to the pet dryer to dry the fiber the rest of the way. 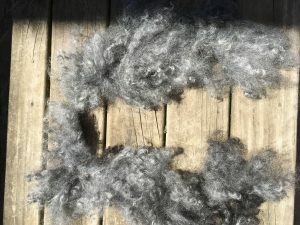 Having a standard poodle to groom regularly provides some nice tools to double as fiber prep too. I’m very pleased with the locks. The color is wonderful with excellent shine. What I learned by prepping this batch was how easily it was to felt this fiber. It isn’t horrible by any means. The fiber is totally spin able. The next batch I will add the extra step to go back to my normal washing/rinsing using the straining bowl method. Lesson learned! But… look at the happy accident a felted collar. The beginning of possibilities. A truly added feature for a wearable art piece.